All papers contained in this section have been published with the authors' and where required publishers' permission. Visitors should contact the authors/publishers directly for permission to copy or publish them further. Papers by Xiaomi An, Associate Professor, School of Information Resources Management, Renmin University of China, council member of the Chinese Urban Development Archives and Information Professional Committee, and related affiliations in architectural and urban development archives in which she is an authority. Xiaomi An and Michael Cook, University of Liverpool Center for Archive Studies. "Integrated Management and Services for Urban Development Records, Archives and Information: A Research Agenda" "This paper introduces a research agenda on 'integrated management and services for urban development records, archives and information', a national research project supported by the National Natural Science Foundation of China. It discusses seven aspects of the agenda, they are the research background, research aims, research objectives and questions, focuses and hypothesis of the project, analytical framework and methodology of the project, research plans, and the expected outcomes for the study." Xiaomi An and Shuzhen Wang, Editors, "Research in Integrated Management and Services for Urban Development Records, Archives and Information," proceedings (22 papers by speakers from the UK, USA, Spain, New Zealand and Switzerland) of the international seminar for urban development archives (UDA), Hangzhou, Zhejiang Province, China, April 16-18, 2004, China Architecture & Building Press, ISBN 7-112-05092, 2004. The theme of the seminar was "Evidence, Information and Memory: Research in Integrated Management and Services of Urban Development Records and Archives." See Table of Contents and sample paper by Michael Steemson, Challenges of e-Government and strategies for Records and Archives Management services. "Towards a Best Practice Framework for Managing Urban Development Archives: Case Studies from the UK and China", China Architecture & Building Press, ISBN 7-112-05092-8, 2002. This book is a revised and updated version of Ms. An's Ph.D. dissertation at Liverpool University Center for Archive Studies (LUCAS), England. Foteini Aravani and Gordon Brown, University of Glasgow. A book review of Preservation Management of Digital Materials: A Handbook by Maggie Jones, Neil Beagrie. Numerous projects have explored the problems inherent in the long-term preservation of digital material, while yet others are in the process of doing so. It is an undisputed fact that such endeavours are crucial to the success of any digitisation project or the survival of "born-in-digital" material. A significant issue arising from such efforts has been the apparent scarcity of practical guidelines aimed at establishing best practices within the field. Papers by Philip C. Bantin, Indiana University, IU Archivist and Director, Electronic Records Project. Understanding Data and Information Systems for Recordkeeping, Neal-Schuman Publishers, 2007, and in the UK under the Facet label. Well known for his leadership in the field of electronic records, including his leadership of the Indiana University Electronic Records Project, Bantin explores content management systems, data warehouses, relational databases — the ways an institution can organize and store its information that are changing rapidly. He provides a comprehensive guide to the new technologies that can help us better organize vital documents and information for preservation, search, and retrieval. Bantin looks at the major types of resources — relational databases; data warehouses; and content, document, and knowledge management systems — and the ways each captures, stores, and manages records. Each system is evaluated in light of its ability to manage digital content over the long-term. Bantin also offers suggestions for adapting turnkey systems to better serve organizational needs, tips for implementing systems assessment, and guidance for ensuring systems comply with legal requirements. This is an essential resource for any organization interested in utilizing technology to better maintain their organizational records and data. View Table of Contents and Figures, Forward and Preface. "Indiana University, Electronic Records Project -- Phase II, 2000-2002: Final Report to the National Historical Publications and Records Commission (NHPRC)," Philip C. Bantin, Project Director. "An Overview of the Lessons Learned in the IU Electronic Records Project," Presented at the Society of American Archivists Annual Meeting, Washington Hilton, August 27-September 2, 2001, Session 60. This innovative project is Part II of a multi-phase project follow-up to the University of Pittsburgh Functional Requirements for Evidence in Recordkeeping Project, all of which were funded by the National Historical Publications and Records Commission (NHPRC). It is aimed at designing and implementing an electronic records system using business systems modeling and analysis in the first enterprise system design to make use of portal technology to capture role-based records in the university environment. Possibly the first anywhere to use a distributed content approach for high-transaction financial and HR business processes, it is highly relevant to organizations in the public and private sectors. The project includes experience using a strategic partnership between the Archivist and Auditor. (See associated presentations by Rosemary Pleva Flynn and Rick Barry.) See Electronic Recordkeeping at IU for a full listing of documentation relating to Indiana University research projects on electronic records. Papers by Chauncey Bell, Senior Vice President, Business Design Associates, Inc.
"Organizational Change and The Role of Archivist". Keynote address at the Society of California Archivists meeting, May 1st, 1998, challenging the role of the archivist in the new Millennium. 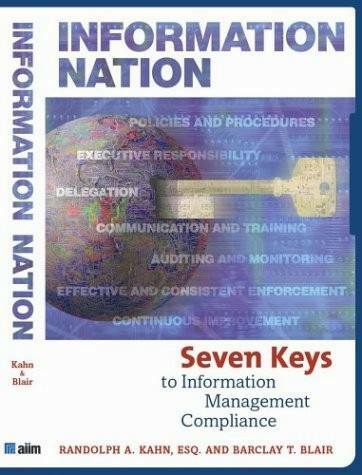 Barclay T. Blair, director of the Technology Practice, Kahn Consulting, and Randolph Kahn, attorney and principal of Kahn Consulting, Inc., Information Nation: Seven Keys to Information Management Compliance, AIIM, Silver Spring, Maryland, ISBN 0-89258-402-5 (pbk. ), 2004. Kahn and Blair have put together an outstanding compendium for CEOs, lawyers, auditors and CIOs, archivists, records managers and other information management professionals. It provides an excellent post-911, post-Enron field book for those who see the emergence of records management in general and electronic records in particular in a broader information management "compliance" context that speaks to all information management professionals. In this new context, these professionals must work together to take account not only of traditional recordkeeping laws, standards, practices and mandates, but also of an increasing number of U.S. regulatory laws and requirements, many of which have emerged because of egregious cases of negligent or improper loss, manipulation or destruction of records. While it takes a life-cycle approach to its seven keys, from "Good Policies and Procedures" (Key 1) to "Continuous Program Improvement," it does so while bringing meaning to Sarbanes-Oxley, HIPAA, E-Sign, 17 CFR §240.17a-4, 21 CFR Part 11 and other regulations and laws. The book is replete with legal cases and precedents. Bruce Bruemmer, Director of Corporate Archives, Cargill, Inc., "Brown Shoes in a World of Tuxedos: Corporate Archives and the Archival Profession," a presentation at the 2006 joint annual conference of the National Association of Government Archivists and Records Administrators (NAGARA), the Council of State Archivists (CoSA) and Society of American Archivists (SAA) in Washington, D.C. The paper is an abbreviated version of a chapter that will appear in Documenting Society and Institutions, Essays in Honor of Helen Samuels, Terry Cook, editor, planned for publication in 2007. At the request of the Records Management Society of Japan, 記録管理学会 . The paper ウェブサイト暫定公開版 (1997年4月開設) was translated into Japanese and is now available here in that translation, compliments of Takashi Asahi. The paper includes a discussion of business recordkeeping ethics and rejoinder to Richard Cox's commentary in the American Archivist, Vol. 68, No. 1, Spring/Summer 2005 on the earlier American Archivist "Sun Mad Raisin" cover issue. "Are there true intellectual gulfs between archives in different sectors, or is the difference one of emphasis? Once I entered the private sector, the dissimilarities between academic and business approaches became painfully clear in a number of fundamental areas. In a forthcoming article, I find unique attributes in six areas, including processing and description, appraisal, the archives relation to history, and the hostile environment in which corporate archives exists. Here, I have time to discuss two." See Richard Cox's rejoinder to the Sun Mad Raisins controversy. For other papers on ethics, see the HOT TOPICS/Ethics page. "Records Matter: Developing the U.S. National Archives Experience," presented at the International Council on Archives (ICA)-CITRA meeting on "How does society perceive archives?” Marseilles, France, Nov-13-16, 2002. This paper outlines the innovative US National Archives and Records Administration's (NARA) "National Archives Experience" project to engage the public directly with NARA resources. "It is in essence a journey – a journey through time, and a journey through our nation’s struggles and triumphs. It will not be a static exhibit, but rather a collection of interactive experiences. It will consist of six components, beginning with a visit to the Charters in the Rotunda of the National Archives Building. A new multi-language audio tool will allow international visitors a more meaningful experience.… Five vaults, each with a different theme, will bring records to life through interactive experiences and connections to popular culture. These vaults will draw their themes from the Preamble to the U.S. Constitution." "NARA in a Changing World," plenary address at the NAGARA Conference on "Sustainable Change: Getting to the Heart of Our Challenges, July 16-19, 1997"
Michael Cook, Senior Research Fellow, University of Liverpool Center for Archive Studies. 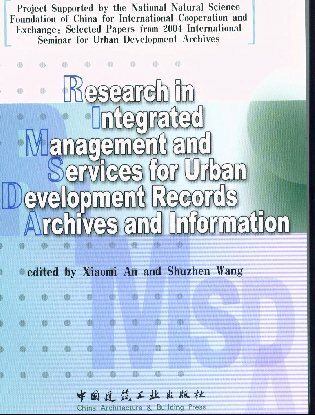 Xiaomi An, Archives College at Renmin University of China and Michael Cook, "Integrated Management and Services for Urban Development Records, Archives and Information: A Research Agenda". "This paper introduces a research agenda on 'integrated management and services for urban development records, archives and information', a national research project supported by the National Natural Science Foundation of China. It discusses seven aspects of the agenda, they are the research background, research aims, research objectives and questions, focuses and hypothesis of the project, analytical framework and methodology of the project, research plans, and the expected outcomes for the study." Papers by Terry Cook, Professor, Archival Studies, University of Manitoba and Clio Consulting. From theory to practice.... Anyone who thinks that theory is for academia rather than to guide recordkeeping practice and the design of modern information systems, including recordkeeping systems, will learn differently from reading the following seminal papers by Terry Cook. As Cook says in his NARA seminar, "the opposite of practical is impractical, not theoretical." The first of the two-part series, "Archival Science and Postmodernism: New Formulations for Old Concepts", addresses the theory of "the archive" in the "postmodern world," the shift away from viewing records as static physical objects, and towards understanding them as dynamic virtual concepts and the implications for archivists and other information managers. The second of the series, "Fashionable Nonsense or Professional Rebirth: Postmodernism and the Practice of Archives", addresses the conditions of postmodernity (with special attention to information) in which archivists and record-keepers find themselves (whether they like it or not) and what the practical implications of the resulting postmodernism is for their work in appraisal and description. "Beyond the Screen: The Records Continuum and Archival Cultural Heritage." Delivered at the Australian Society of Archivists Conference, Melbourne, August 18, 2000, the paper provides Cook's strong articulation of the need and room for balance between the evidentiary and cultural heritage purposes for recordkeeping. In the process, he takes the shrouds off of the 'continuum' approach to recordkeeping and demonstrates its potential power as a means for reconciling both important purposes. "Archival Appraisal and Collection: Issues, Challenges, New Approaches ." Part of a seminar series given at the US National Archives and Records Administration, April 21-22, 1999. Cook presents a strong case for distinguishing archival theory from appraisal theory and develops the latter, including views on business system analysis, macroappraisal and microappraisal. "What is Past is Prologue: A History of Archival Ideas Since 1898, and the Future Paradigm Shift " A much shorter version of this 48-page essay was delivered at the Thirteenth International Congress on Archives held in Beijing, China, in September 1996. Other versions were circulated and have been cited in the literature; however, Cook says about this much expanded and annotated version: "I consider this version in Archivaria [43 (Spring 97)] to be the definitive text." It will provide an excellent on-line source of theory for system designers, practitioners, researchers, and students on the postcustodial model of recordkeeping that Cook has championed for years. It analyzes the history of archival thought since the publication of the Dutch Manual a century ago and suggests that from this inspiring past a new conceptual paradigm is emerging for the profession. Ideas of leading or symbolic thinkers within the European, North American, and Australian archival traditions are considered within the context of their times. For the future, the trends of the century suggest the need to reconceptualize traditional archival principles from a product-focused to a process-oriented activity, to preserve in the best manner the collective memory of nations and peoples. Papers by Richard J. Cox, Professor, Archival Studies at the University of Pittsburgh School of Information Sciences, editor of Records and Information Management Report (RIMR), Society of American Archivists Publications Editor and former editor of the Society's professional journal, the American Archivist. Ethics, Accountability and Recordkeeping in a Dangerous World, Facet Publishing, London, 2006. This most recent book by the distinguished and prolific educator, author and editor ties together two distinct but highly related topics of ethics and accountability as they impinge on recordkeeping. Read the Table of Contents and Chapter Four, "America's Pyramids: Presidents and Their Libraries," an assessment of the history and development of presidential libraries that concludes with a most provocative proposal for re-centralization of presidential libraries in a single presidential library in or near Washington, D.C. under NARA. (An earlier version of this chapter previously appeared in Government Information Quarterly 19 (2002) 45-75.) See also Michael Moss's review of this book in the Records Management Journal. Moss raises several issues; he concludes: "Like everything Richard Cox writes this book makes you think in the way that it has made this reviewer think. He poses lots of questions in the full expectation that you may not agree and draws on a rich literature. What is more it is a good read." * From accountability to ethics, or when do records professionals become whistleblowers? * Searching for recognition: does strategic information have ARMs? Cox's rejoinder to the controversy over the Sun Mad Raisins American Archivist cover (Vol. 66, No. 2, Fall/Winter 2003). See also commentary by Bruce Buemmer's "Brown Shoes in a World of Tuxedos: Corporate Archives and the Archival Profession." "Former President Giuliani and His Library?" This op-ed piece was submitted by Richard Cox to the New York Times, which, regrettably, did not publish the piece. It constitutes an excellent commentary on the importance of the public records of elected officials in the context of the Presidential Library System and the November 1, 2001, Executive Order 13233, with new procedures for opening Presidential records involving the Archivist, the former President and the incumbent President, leading to editorials with phrases such as a “dark oval office,” evidence of a “secrecy fetish,” “keeping secrets,” an “attack . . . on history itself,” and a “nasty blow” to the “ideal of open government.” This piece continues to be relevant as other high elected officials, most recently the former Virginia Governor Gilmore, come under serious question for lack of forthcomingness in turning over public records to the appropriate archival authorities. Richard Cox, and David Wallace, Assistant Professor at the School of Information, University of Michigan. Editors, Archives and the Public Good, Greenwood Press, 2002. The editors write: "we have become both colleagues and friends, all the while constantly rediscovering that we share similar convictions about the importance of records in our society and the need to educate professionals who understand that records are not only artifacts for use by historians and genealogists but that they are also essential sources of evidence and information providing the glue that holds together, and sometimes the agent that unravels, organizations, governments, communities, and societies." Read the Table of Contents and the Introduction here; and read about the many outstanding Contributors to this book. This book should be required reading for all educators and students of archives and records management, and for executives who want to avoid ruin over absent or misused records. See book review by Roy Rosenzweig, Department of History, George Mason University in American Archivist (Vol. 66, No.2, Fall/Winter 2003). Podcast: "Government 2.0 Taskforce with Adrian Cunningham & John McDonald" (41 mins). Download provided by Julie McLeod, Professor in Records Management at Northumbria University & Project Director AC+erm research project as part of a monthly podcast series on the records management issues affecting organisations and professionals today, from Northumbria University's School of Computing, Engineering & Information Sciences. In this podcast Julie McLeod discusses the Australian Government’s new Government 2.0 Taskforce which was officially launched on 22 June 2009 by Lindsay Tanner, Minister for Finance and Deregulation, and chaired by Nicholas Gruen. Adrian Cunningham, Director, Strategic Relations and Personal Records at the National Archives of Australia, explains the background to Government 2.0 and the taskforce remit in the wider context of open government, citizen engagement and the use/reuse of public sector information. John McDonald adds his own personal perspective on the initiative based on his experience from a career at the National Archives of Canada, where he was responsible for the management of records across the Government at a time when electronic records management challenges were being addressed. The discussion covers some of the records management/recordkeeping implications posed by the use of Web 2.0 technologies. Both Adrian and John are members of Northumbria’s AC+erm project Expert Panel. Papers by Charles Dollar, Dollar Consulting. "Archival Preservation of Smithsonian Web Resources: Strategies, Principles, and Best Practices," July 20, 2001. This is the report on which Dollar's PowerPoint presentation at the Society of American Archivists Annual Conference Business Archives Colloquium session at the Washington Hilton , August 29, 2001 was based. It summarizes Dollar's engagement with the Smithsonian Institution, the purpose of which was to develop a white paper on issues and options relating to the management of websites for both regulated and unregulated organizations in an emerging content management environment. Authentic Electronic Records; Strategies For Long-Term Access. 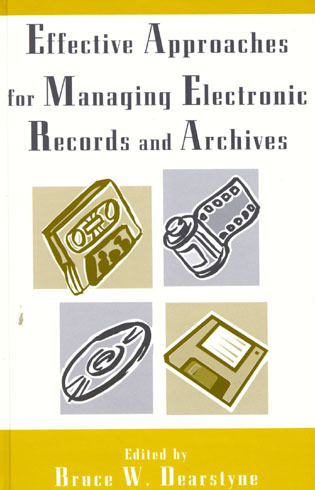 An excerpt from the author's book on preservation of electronic records. See also the book review by Rick Barry. Verne Harris, "On the Back of a Tiger: Deconstructive Possibilities in ‘Evidence of Me’" a riposte to Sue McKemmish's "Evidence of Me". See also the rejoinder to Harris' paper by Frank Upward and Sue McKemmish, "In Search of the Lost Tiger, by Way of Sainte-Beuve: Re-constructing the Possibilities in ‘Evidence of Me…’"
"An Expanding Universe. Metadata and Accessibility of Digital Information," a presentation at the DLM Forum 2002, that explores the future accessibility of the mass of digital information resources now available, e.g. on the world wide web, and growing every minute, and poses the question: To what extent are traditional tools and approaches still sufficient? "A global issue: preservation of digital objects," presented at a conference of the Korean Association of Archives Management in Seoul, 3-4 July 2002. The natural ally of preservation is accessibility, otherwise it would not make any sense. The objective of this paper is to provide an overview of the main issues and requirements, the main developments to date in the search for solutions, a brief description of achievements and available tools and some initial steps that could be taken to implement proper management of digital records and related preservation strategies, starting with record creating agencies. "Recordkeeping in the New Economy," presented at the 17th National Convention of RMAA, titled ‘Bridging the Gap’, in Sydney, December 6, 2000. The paper addresses the gap between technology and records management and, more importantly, the gap between theory and practice. How can we translate all the theories, ideas and concepts emerging from the recordkeeping or archival discourse into the everyday practice of recordkeeping and achieve a transition from paperbound to digital processes and procedures? Political Pressure and the Archival Record Revisited: "The Role of the Archives in Protecting the Record from Political Pressure." This is an August 2004 reprise and update of a paper originally presented at the LUCAS Conference in Liverpool, July 2003. It was presented to the ICA 2004 - Archives, Memory & Knowledge, Conference, August 25, 2004. "The role of the archives in protecting the record from political pressure," keynote presentation given at the Liverpool University International Conference on Political Pressure and the Archival Record, 22-25 July 2003 and published in the forthcoming Proceedings of that conference by the Society of American Archivists. “Recordkeeping, Document Destruction, and the Law (Heiner, Enron, and McCabe)”. This paper is a revised version of an article that originally appeared in Archives & Manuscripts in the issue for November 2002 (Vol. 30, No. 2) pp. 6 - 25. Hurley was awarded the Michael Standish Prize by the Archives & Records Association of New Zealand (ARANZ) for this paper. Brewster Kahle, President, Internet Archive, "Archiving the Internet: Towards a Core Internet Service," a presentation at the NAGARA Conference on "Sustainable Change: Getting to the Heart of Our Challenges," July 16-19, 1997. Papers by Eric Ketelaar, Professor of Archivistics, University of Amsterdam, and Honorary Professor at Monash University , Melbourne (Faculty of Information Technology, Centre for Organisational and Social Informatics). He is former General State Archivist (National Archivist) of the Netherlands from 1989-1997. Sign Here! Handwriting in the Age of New Media, Sonja Neef, José van Dijck and Eric Ketelaar, editors, Amsterdam University Press (July 15, 2006), Table of Contents. "The Archive as a Time Machine": The ICT-industry and public sector partnership: to promote the preservation and accessibility of the European archival heritage," presented at the DLM Forum 2002 conference. In our “age of access” record keeping systems and archival institutions are moving from providing physical documents to providing access to the collective memory. In most organizations the boundaries between records and non-record material, and those between personal and institutional memory are blurring. What the risks are of an organizational memory being dependent on what individuals have stored on their laptops and PC’s, has been dramatically shown by the September 11 tragedies. Therefore organizational record keeping systems should ensure that individual and organizational memories blend together. Michael Kurtz, Assistant Archivist for Records Services, National Archives and Records Administration, "Managing Archives in a Time of Change." A Microsoft PowerPoint™ presentation at the 2006 joint annual conference of the National Association of Government Archivists and Records Administrators (NAGARA), the Council of State Archivists (CoSA) and Society of American Archivists (SAA) in Washington, D.C., July 30 - August 5, 2006. Kurtz graphically conceptualizes and discusses leadership and organizational culture aspects of change management. "Many archivists and archival institutions have a collecting mission that includes personal papers, manuscripts, and other noninstitutional materials. Despite a massive increase in the volume and complexity of personal digital collections, the literature... has long been limited to a few scattered journal articles and research project websites. I Digital aims to fill this gap. It explores issues, challenges and opportunities in the management of personal digital collections, focusing primarily on born-digital materials generated and kept by individuals, as opposed to electronic records that are generated within and managed by formal organizational recordkeeping systems. It represents a convergence and synthesis of literature and thinking about how cultural institutions can grapple with new forms of documentation and how individuals manage (and could potentially better manage) the digital information that is part of their contemporary lives." View the full Introduction, Table of Contents, Biographies of Authors and Index HERE. See also, elsewhere in MyBestDocs, the HOT TOPICS: Personal Electronic Records Section, for other writings on this subject including by some of the contributors to this book. Elisa Liberatori Prati, The World Bank Archivist and World Bank Archives staff member Andres McAlister. "The World Bank Learning Program on Archives and Records: A Progress Report." Presented at the Society of American Archivists Annual Meeting, Washington Hilton, August 27-September 2, 2001, Session 64SF. They were accompanied on the program by Jim Huttlinger, World Bank archivist and Anne Thurston, Executive Director, International Records Management Trust. This session was dedicated to a special project of the World Bank. Its Information Solutions Group, of which the Bank’s archives and records management functions are a part, has launched a web-based Learning Program on Archives and Records Management as poverty reduction tools and in 2001 a follow-up program on archives and records in governance, “Evidence-Based Governance in the Electronic Age”--in partnership with the Bank’s Poverty Reduction Network (PREM). This is an excellent example of a project that ties recordkeeping to good government and economic development. Toronto, Canada, "Business Systems Analysis: Municipal Modelling and Functional Thesauri,"a presentation at the NAGARA Conference on "Sustainable Change: Getting to the Heart of Our Challenges," July 16-19, 1997. Bertram Ludascher, Richard Marciano, Reagan Moore, San Diego Supercomputer Center, University of California, San Diego, "Preservation of Digital Data with Self-Validating, Self-Instantiating Knowledge-Based Archives". "Digital archives are dedicated to the long-term preservation of electronic information and have the mandate to enable sustained access despite rapid technology changes. Persistent archives are confronted with heterogeneous data formats, helper applications, and platforms being used over the lifetime of the archive. This is not unlike the interoperability challenges, for which mediators are devised. To prevent technological obsolescence over time and across platforms, a migration approach for persistent archives is proposed based on an XML infrastructure..."
Stephen Macintosh, Archivist at the Reserve Bank of Australia, "Designing Information and Recordkeeping Systems: Making DIRKS Work", a case study outlining the author's experiences introducing DIRKS (Designing Information and RecordKeeping Systems) at the Human Rights and Equal Opportunities Commission (HREOC) in Sydney. The DIRKS methodology is an eight-step process with which agencies may improve their recordkeeping and information management practices, including the design and implementation of new recordkeeping systems. The methodology is compliant with, and expands on, the methodological framework of the Australian Standard for Records Management, AS ISO 15489 – 2002. The study includes the many positive aspects the author found and some of the challenges he encountered. He also makes several suggestions aimed at improving implementation of DIRKS by central archives and records management authorities. McDonald, John, Records Management Consultant, Podcast: "Government 2.0 Taskforce with Adrian Cunningham & John McDonald" (41 mins). Download provided by Julie McLeod, Professor in Records Management at Northumbria University & Project Director AC+erm research project www.northumbria.ac.uk/acerm as part of a monthly podcast series on the records management issues affecting organisations and professionals today, from Northumbria University's School of Computing, Engineering & Information Sciences. http://www.northumbria.ac.uk/sd/academic/ceis/re/isrc/x. In this podcast Julie McLeod discusses the Australian Government’s new Government 2.0 Taskforce which was officially launched on 22 June 2009 by Lindsay Tanner, Minister for Finance and Deregulation, and chaired by Nicholas Gruen. Adrian Cunningham, Director, Strategic Relations and Personal Records at the National Archives of Australia, explains the background to Government 2.0 and the taskforce remit in the wider context of open government, citizen engagement and the use/reuse of public sector information. John McDonald adds his own personal perspective on the initiative based on his experience from a career at the National Archives of Canada, where he was responsible for the management of records across the Government at a time when electronic records management challenges were being addressed. The discussion covers some of the records management/recordkeeping implications posed by the use of Web 2.0 technologies. Both Adrian and John are members of Northumbria’s AC+erm project Expert Panel. Julie McLeod Reader & Programme Leader MSc Records Management, School of Computing, Engineering & Information Sciences, Northumbria University and Editor of the Records Management Journal, and Catherine Hare, Project Researcher and former Senior Lecturer in Information and Records Management, Northumbria University, Managing Electronic Records, Facet Publishing, London, 2005, pp. 202. This book explores issues and offers solutions, not only for records professionals but also for information, IT and business administration specialists, who, as key stakeholders in managing electronic information, may have taken on crucial roles in managing electronic records in their organization. It IS also a key textbook for records management courses. See review by Rick Barry in the Records Management Journal, Vol. 16, No. 1, 2006; Emerald Group Publishing Limited, Bradford, UK, pp. 57-66, published here with the kind permission of the publisher. Papers by Sue McKemmish, Associate Professor, Master of Arts (Archives and Records) and Graduate Diploma in Archives and Records Management programs at Monash University, Victoria, Australia. See also, under Upward, co-authored paper: "In Search of the Lost Tiger, by Way of Sainte-Beuve: Re-constructing the Possibilities in ‘Evidence of Me…’"
Archives: Recordkeeping in Society, by Sue McKemmish, Michael Piggott, Barbara Reed and Frank Upward, Editors, Centre for Information Studies - Charles Sturt University (CIS), Waga Waga, NSW, Australia, 2005. The editor-authors (all raised on the Australian Keeping Archives project) and a host of other outstanding scholars and practitioners, well known in the professional literature, together in a dozen chapters – Adrian Cunningham, Ann Pederson, Robert Hartland, Hans Hofman, Chris Hurley, Livia Iacovino and Eric Ketelar – provide a broad array of perspectives making up the world of archives and recordkeeping that make this volume an excellent source of material for teaching archives and records management as well as for purposes of public advocacy. The editors write: "The purpose of this book is to provide a conceptual base for arch9ival science which coherently incorporates both established and emerging concepts within the discipline. The challenges posed by changing technologies necessitate such new overviews. Although archivists face these new challenges directly, their implications reach beyond the archival profession. Almost everybody, not just those paid to do the work that this entails, is an archivist and a records manager and all of us have a stake in the relationship between archives and human activity. Accordingly we hope this book will be available resource within and beyond the archival profession by exposing leading archival thinking to scholars, thinkers and practioners in many disciplines. See also, a review by Joanna Sassoon, Public History Review, vol 12, 2006. Raul Medina-Mora, Senior Vice President and Chief Scientist, Action Technologies, Inc., "Implications for Recordkeeping in Organizations that are Redesigned around Business Processes, Commitments and Customer Satisfaction," a presentation at the NAGARA Conference on "Sustainable Change: Getting to the Heart of Our Challenges," July 16-19, 1997. "Converted Slide Version of above document presented at NAGARA," presented at the NAGARA Conference on "Sustainable Change: Getting to the Heart of Our Challenges," July 16-19, 1997. Laura Mitchell, National Archives of Scotland, "EMAIL: Elephant Traps and How to Avoid Them." There are really three main aspects of email which get us all thinking: 1) Its use (eg etiquette); 2) Its security; 3) It’s management. Helen Onopko, Records & Archive Services, "Evolving access solutions – repatriation of records to indigenous communities," paper, and accompanying slide presentation presented at the Records Management Association of Australia (RMAA) 2002 National Convention, September 17, 2002. Onopko outlines the very innovative approach of the South Australia State Archives in making personal, family and tribal archives of Australian Aboriginals accessible to those stakeholders including in remote areas, and taking account of special cultural issues relating to those people. This is also a excellent addition to the literature on personal records and, as they are now provided, personal electronic records. Michael Piggot, University of Melbourne: Recordkeeping in Society, Coauthored with Sue McKemmish, et al, Editors. See full listing under McKemmish, above. Lisa Polisar, Covington & Burling" international law firm, Washington D.C. "Electronic Document and Records Management at a U.S. Law Firm," presented at the Society of American Archivists Annual Meeting, Washington Hilton, August 27-September 2, 2001, Session 35. (See associated presentations by Ineke Deserno and Cathy Bailey. See also, under McKemmish: Archives: Recordkeeping in Society, by Sue McKemmish, Michael Piggott, Barbara Reed and Frank Upward, Editors. Nicholas Ring, University of North Carolina (Chapel Hill), participant in Educating Stewards of Public Information Infrastructure (ESOPI2) dual degree fellowship program. "Best Practices for Electronic Communications Usage in North Carolina: Text and Instant Message," March,2012, published here with the kind permission of the author and Principal Investigators of the ESOPI2 program. Nick previously worked at the state headquarters for the American Civil Liberties Union of North Carolina, as well as the Central Intake Unit for Legal Aid of North Carolina. He is currently interning at the Government Records Branch of the Archives and Records Section, North Carolina Department of Cultural Resources. As part of his internship, Nick undertook a consulting study of text messages as records for the North Carolina Department of Cultural Resources. For bios of program participants, and information on participant availability, contact Professor Helen Tibbo or Cal Lee, Asst. Professor and program PI and Co-PI respectively. David Roberts, CEO, State Records Authority, New South Wales, NSW, Australia, Archives Authority of New South Wales, Australia, "The New Australian Records Management Standard," a presentation at the NAGARA Conference on "Sustainable Change: Getting to the Heart of Our Challenges," July 16-19, 1997. Papers by David Rothman, business and technology author, national coordinator of TeleRead and Managing Editor of Fee-Only Investor newsletter, Windsor Asset Management. "Paper Hoarders vs. Byte Manipulators: Can We Reconcile Good Records Management With Good Information Management?" An IT author and guru's guru speaks to the CIO community with a records management wakeup call. "TeleRead: The Case for a Well-Stocked National Digital Library System for All," presentation at the Library of Congress, November 5, 2001. "Archival Aerobics: Jogging the Institutional Memory," originally published in the New England Archives Newsletter, Sanford outlines the very innovative "Continuing Issues" program that he has initiated at the Vermont State Archives, now using web technology to support the Vermont State Legislature and public in dealing with current issues that have have a knowledge base in the State Archives from previous like situations. The Vermont State Archives is seeking to wed the archival concept of continuing value with the idea that there are continuing issues; issues that each generation has had to address within its own social expectations and fiscal realities. As a society we have always grappled with economic development, taxation, education, public health, crime and punishment, and the tensions between the "freedom to" and the "freedom from." Such issues are, unlike archival concepts, broadly understood. A special breed of knowledge-management practicing archivist, Gregory received the 2002 New England Archivists' Distinguished Service Award and the Vermont State Archives continuing issues section received the SAA's 2002 Hamer-Kegan Award for increasing public awareness of manuscripts and archives through publication. This is the first time the Hamer-Kegan Award has been accorded a Web publication. Elizabeth Shepherd, Lecturer, Archives and Records Management and Geoffrey Yeo, Director, Masters Programme in Archives and Records Management, University College London, Managing Records: A Handbook of Principles and Practice, Facet Publishing, London and Neal-Schuman Publishers, Inc, New York, 2003. This book is based on its authors’ experience as practising professionals and educators. It describes and discusses the principles of records management and their practical implementation in contemporary organizations. It is probably the first book of its kind to give full and equal coverage to the management of both paper and electronic records. While addressing an English-speaking readership the book seeks to maintain an international perspective. It does not assume that readers will have any prior knowledge of the subject, but it is intended to be of value to experienced practitioners as well as newcomers to the field. Among other features of interest to established professionals, the book takes account of the latest work on electronic records management and proposes new models for organizational analysis and records classification. See the Table of Contents and Chapter 8: "Implementing Records Management: Practical and Managerial Issues." Frans Smit, Manager of the Section of Archival Descriptions and Cataloguing, Municipal Archives of Amsterdam, "The Historical Data Warehouse," on adapting concepts from Information and Knowledge Management (IKM) and Information and Communication Technology (ICT) to organizing and giving access to metadata about historical archives and collections. J. Timothy Sprehe, President, Sprehe Information Management Associates, Inc., "Analysis and Development of Model Quality Guidelines for Electronic Records Management on State and Federal Websites," a presentation at the NAGARA Conference on "Sustainable Change: Getting to the Heart of Our Challenges," July 16-19, 1997. Michael Steemson, Principal, The Caldeson Consultancy, Wellington, New Zealand. "ISO15489: Set it to music. You’re gonna need it!" This is Steemson's update since ISO 15489 was approved and launched internationally from Montreal in October 2001. See several other papers by Mike Steemson at The Caldeson Consultancy website. Jim Suderman, National Archives of Canada "Context, Structure and Content: New criteria for appraising electronic records." Since this provocative paper was delivered at the Annual Conference of the Association of Canadian Archivists in June, 2001, a discussion paper, Requirements for Assessing the Authenticity of Electronic Records, prepared by the InterPARES Authenticity task force, has become available with related topical coverage. "Preserving Digital Memory at the National Archives and Records Administration of the U.S.," by Kenneth Thibodeau, presentation at the "Workshop on Conservation of Digital Memories Second National Conference," Bologna, Italy, 20 November 2009. This is an unpublished paper that is published here with the kind permission of the author. The author plans to publish in a longer version of the paper at a later date. At time of this publication, it reflected the latest published update on the status of the ($350,000,000+ to-date) ERA system. It covers the history of digital archiving at NARA and the logarithmic increase in digital acquisitions of electronic records in numerous formats since that time. Most recently this involved the transfer of 77 terabytes of Bush-2 records (some 35 times more than the Clinton records and likely to be eclipsed by the records of President Barak Obama given his having been an early adopter of digital technologies including Web-2, social networking and most recently smartphone technologies for business purposes. At time of this writing, the latest NARA press release on ERA was, "National Archives and Records Administration Reaches Another Milestone: George W. Bush Electronic Records Now Part of the Electronic Records Archives, September 9, 2009". Future such releases may be found at the NARA Press Release Website. "A Dynamic Solution for Electronic Records: The National Archives & Records Administration’s Electronic Records Archives," presented at the International Conference on the Preservation of Digital Objects (iPRES 2006) October 8-10, 2006, Cornell University, Ithaca, NY. ERA is NARA’s strategic initiative to build a virtual archives capable of preserving all types of electronic records and delivering them to future generations of users on future generations of technology. The system will enable a comprehensive transition of NARA’s government-wide management of the records of the U.S. Government into the realm of e-government. It will automate records management processes, such as scheduling and appraisal, transfer of records to NARA, and destruction of temporary records. These functions will be applicable to records of all types, and support NARA’s different lines of business in the National Archives, Presidential Libraries, and Federal Records Centers. The system will also enable NARA to realize its vision of preserving and providing continuing access to any type of electronic record, free from dependence on the hardware and software originally used to create and store it, for as long as the records need to be retain, which includes for the life of the republic. In this Microsoft PowerPoint™ presentation, Thibodeau describes the architecture and processes for digital preservation and access in the ERA system. See related ERA papers available at mybestdocs.com: Allen Weinstein's Swearing-in Ceremony Remarks as Ninth Archivist of the U.S.; and, by Rick Barry, "Saving the future now: Commentary,"and "Record challenges: Commentary." Upward, Frank, Lecturer, Monash University, "In Search of the Lost Tiger, by Way of Sainte-Beuve: Re-constructing the Possibilities in ‘Evidence of Me…’" co-authored with Sue McKemmish. 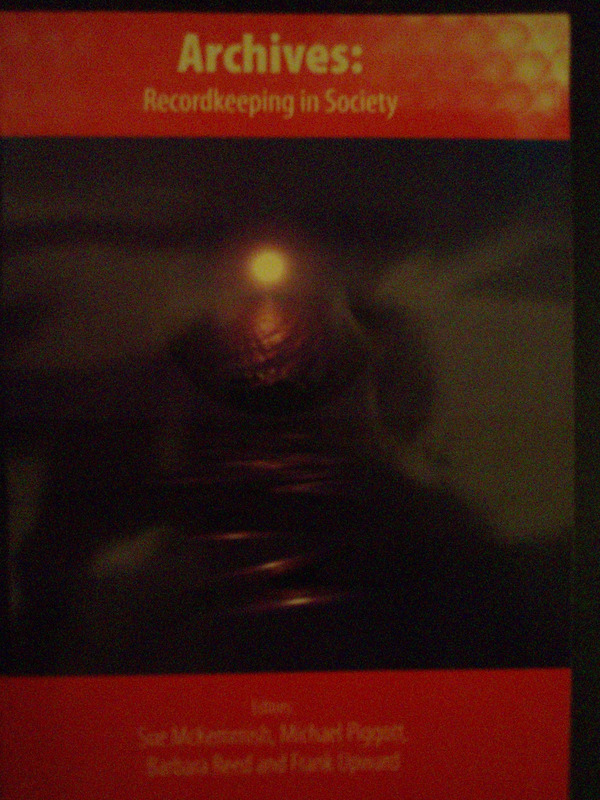 See also under McKemmish: Archives: Recordkeeping in Society, by Sue McKemmish, Michael Piggott, Barbara Reed and Frank Upward, Editors. Papers by David A. Wallace, Assistant Professor at the School of Information, University of Michigan. The paper: Recordkeeping and Electronic Mail Policy: The State of Thought and the State of the Practice. Expert on email policy, Wallace provides a literature review on the subject. 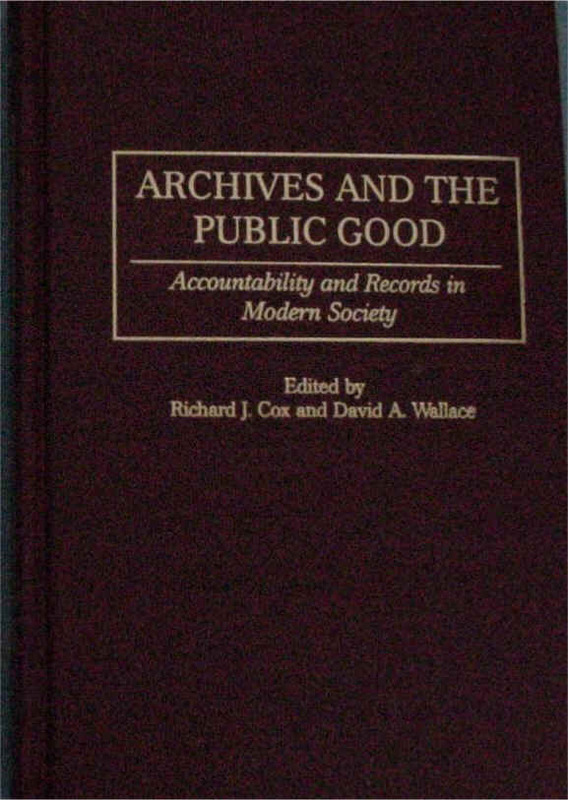 Archives and the Public Good, co-edited by Richard Cox and David Wallace, Professor, Archival Studies at the University of Pittsburgh School of Information Sciences, Greenwood Press, 2002. The editors write: "we have become both colleagues and friends, all the while constantly rediscovering that we share similar convictions about the importance of records in our society and the need to educate professionals who understand that records are not only artifacts for use by historians and genealogists but that they are also essential sources of evidence and information providing the glue that holds together, and sometimes the agent that unravels, organizations, governments, communities, and societies." Read the Table of Contents and the Introduction here; and read about the many outstanding Contributors to this book. This book should be required reading for all educators and students of archives and records management, and for executives who want to avoid ruin over absent or misused records. Alan Weinstein, Ninth Archivist of US, Remarks at his swearing-ceremony. Dr. Allen Weinstein is a noted scholar; author of The Story of America (2002), The Haunted Wood: Soviet Espionage in America-The Stalin Era (1999), and Perjury: The Hiss-Chambers Case (1997) and other publications; former professor of history and American studies at Smith College, Georgetown University, and Boston University and a recognized leader in global democracy issues. He took office as the Ninth Archivist of the United States on March 7, 2005. He was sworn in by U.S. Supreme Court Associate Justice Ruth Bader Ginsburg. In her "Investiture of Dr. Allen Weinstein" remarks, Justice Ginsburg discusses the history of the swearing-in oath. Marsha Cook Woodbury, faculty member, Department of Computer Science, University of Illinois at Urbana-Champagne and former board member of Computer Professionals for Social Responsibility. 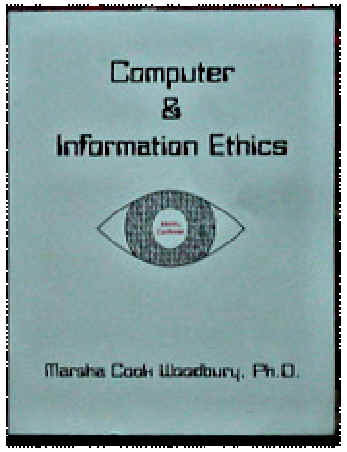 Computer & Information Ethics, Stipes Publishing, Champaign, IL, ISBN 1-58874-155-9. Read the Table of Contents and Introduction. "Technology is driving the future: Who is doing the steering?...Taking time to think about computer and information ethics will not supply set answers to the choices we have to make, but it will prod us to reflect, ponder, evaluate, learn, and cogitate." This book should be required reading for all educators and students of information management, including archives and records management, and for current practitioners such as CIOs, CTOs, IT Directors and the people who work for them.